Kalinka wants to be a helpful bird and clean up her friend’s chaotic clutter, but Grakkle definitely does not want help, and does not want Kalinka to tidy up his things. They simply aren’t on the same wavelength. Can an unfortunate accident plus a little humor and empathy help this little bird and big beast see eye to eye? Author-illustrator Julie Paschkis delves into her writing and illustrating process and explains what inspired the humorously contradicting characters in Kalinka and Grakkle. Q: What inspired you to write this tale of unexpected friendship? A: I was fooling around, rewriting "Goldilocks and the Three Bears." I’ve never understood—in the original Goldilocks—why it was OK for her to walk into someone else’s home. So I turned Goldilocks into an officious little bird who thinks she is more helpful than she actually is, and thinks it is her right to do whatever she wants. In her helpful way she turned the story into one that was more about her and not a Goldilocks story. Q: Where did you come up with the idea of Grakkle? A: Originally I had a family of beasts—like the three bears—but I found the story more interesting if it was about the relationship between two characters. First I thought of him only making one sound “Graak” and then that became his name. Q: Are you more like Kalinka or Grakkle at home? A: I am a bit of both. Like Kalinka I tend to value my own ideas quite highly; sometimes I need to back off and listen. Like Grakkle I place housecleaning low on my list of priorities when I am busy (or not busy). Q: How did you get into the world of children’s book illustration? A: My first introduction was a reader/looker when I was a child. It was something I always wanted to do. In 1991 I took a class from Keith Baker and learned about how to illustrate children’s books—how to make a storyboard, a dummy etc. It changed my life—I’ve been making books for a living ever since. Q: What is your process as both the author and illustrator of a book? How is your process of writing and illustrating different from only illustrating a book? A: The process is pretty similar. I usually paint one or two sample paintings in the style that I envision for the whole book. Then I divide the story into pages and make a storyboard with very rough sketches. Then I refine the sketches and send them in and get feedback. Then I paint the rest of the pictures. I try to make the art tell the story as well as the words. When I have written the words I can sometimes change them if I feel it improves the overall tale. When I am not the author I only change the art! Q: When you are writing and illustrating a book, do you think about the text or the illustrations first? A: I toggle back and forth between them. Sometimes the first thing I see is an image, sometimes it is a verbal idea. When I am creating a storyboard—figuring out the flow of a book—I divide up the text and figure out the pagination before doing any drawing. Sometimes the page divisions change as I work. My goal is to create a book where they are indivisible. Q: What influences your artistic style? Q: What are your favorite colors or shapes to use in illustrations? How do you come up with all of the patterns and designs used throughout the book? A: I love color and pattern. I don’t have one favorite color. I want to make the colors sing. That comes from putting colors next to each other and trying different hues until they work together—until they sing. One combination of red and green can look dead; another combination with slight changes can be lively. As to patterns, in addition to illustrating children’s books I also design fabric. I could draw patterns forever; it is harder for me to leave space open than to fill it up with pattern. A: I would like readers to realize that there are many ways to be in the world, and that we can get along with people who are different than us. Also, that it’s okay to argue and to work it out. And I want them to find the story funny. 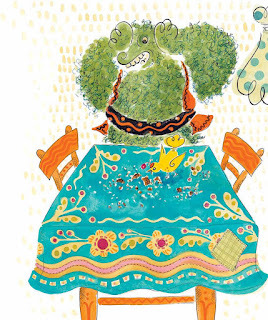 Check out Julie Paschkis's blog post to learn more about the creation of Kalinka and Grakkle and see the evolution of her illustrations! Find Kalinka and Grakkle at your local library, indie bookstore, or Barnes & Noble April 1!